Cotton has been genetically engineered to resist both glyphosate (by Monsanto) and glufinsate (by Bayer CropScience) under the names Roundup Ready and LibertyLink respectively. As I’ve discussed in previous posts, there are both economic and scientific advantages to having more than one herbicide/herbicide resistance system as it tends to keep prices down, and slows the development of resistant weeds when any resistance they evolve to one herbicide will be useless if the farmer switches to the other for the next growing season. Cotton was first domesticated in Mexico eight thousand years ago, and a separate species was domesticated in present day Indian and Pakistan approximated a thousand years later. It was the second cotton that first found its way to Europe, along with the spice trade, where it was used by people who had never seen the plants themselves, and were all amazed that it came from a plant, unlike their primary source of clothes at the time, wool. 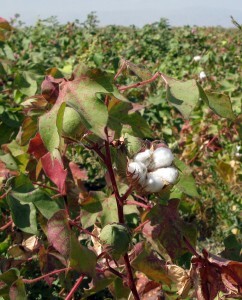 Much of the cotton grown today, even in India, can trace more of its heritage to the cotton domesticated in the Americas than to the original cotton of Eurasia. It’s not 100% though, as cotton breeders (like so many others), has been pulling useful genes across the species barrier long before genetic engineering entered the picture. *Several different species produce the fibers we refer to as “cotton”. The four most signficiant are Gossypium arboreum, Gossypium barbadense, Gossypium herbaceum, and Gossypium hirsutum, with the last one, hirsutum, being the primary producer of cotton in the world today. **In terms of countries were farmers grow it, I haven’t checked about total acreage. ***In India, there are no patents on genes, so in addition to seed sold by local partners of Monsanto (I don’t know anything about Dow’s present in India), Indian farmers can buy cotton seeds containing the bt transgene Monsanto developed or at least one of the ones developed by the Chinese government from small local seed producers that have legally “pirated” the genes. 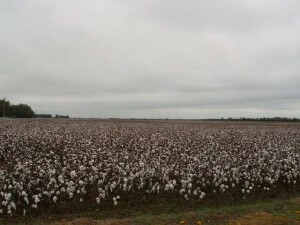 The genes are introgressed into all sorts of local cotton varieties. Make no mistake, being a small farmer in India is neither a happy nor secure length. When the rains don’t come, or any of a dozen other agricultural disasters occur, the farmers have no reserves to allow them to survive until the next harvest, in fact many of them go heavily into debt to finance every seed the goes into the ground, and every drop of fertilizer and pesticide they must spray upon it. Bt cotton can reduce the need to spray pesticides by two thirds, which, in a country where the cost of pesticides can easily make up 40% of the cost of growing cotton, is a big deal. More importantly, the health impacts for the people who are living on ~dollar per day, and were working in pesticide fields with little or no protective gear are huge. Bt cotton is not a cure for the plight of debt ridden farmers with no safety net (that’s one issue that needs societial action, not a scientific fix), but it’s still a Good Thing™, especially in a country where anyone who wants can start breeding and selling bt cotton. ****Especially when you consider the genome of a genetically engineered cotton plant is 99.99% identical to its untransformed parent, a claim I couldn’t make for everything from polyester (originally designed to be a synthetic substitute for cotton), nylon (originally designed to be a synthetic silk, where it replaced actual silk, and make paratroopers a lot more feasible during and after World War II when the US was cut off from sources of real silk) and pleather (not touching this one with a stick). Do you know if the Ow lab at PGEC is still working on gossypol breakdown in cottonseed? I’m glad you’re enjoying it! I’ve had such a good time writing the series, I’ve been thinking about doing one called Non-Genetically Engineered Crops for things that people often claim are genetically engineered, but aren’t. I don’t know the answer about Ow, but I do know one of the new First Years is rotating in his lab, so I’ll be sure to ask next time I run into him.